A Sevenling is a seven line poem comprised of two tercets and a final one-line stanza. Each tercet contains a grouping of three. The two groupings can be connected directly or indirectly or not at all. The last line is a summary, punchline, or juxtaposition. Meter and rhyme are optional. This form feels mysterious, offbeat, or disturbing, as if only part of the tale is being told. Enjoy a bite of sugar-free Word Candy! What I get from this is, you’re a short woman who trick or treats, while passing yourself off as a kid. And you also are not afraid to look at yourself in the mirror, first thing in the morning. Thanks, Marissa. When I read that Sevenlings are “mysterious, offbeat, or disturbing, as if only part of the tale is being told,” it sounded like a perfect form to try for Halloween. Thank you for explaining what a sevenling is and for the very fine examples! So what’s up, 42? Are you gone or not gone? Nice poems. And I can imagine you really DO infiltrate the trick-or-treaters in your ghost costume and bag the candy! I love these, ha ha. 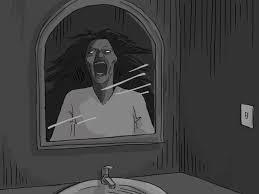 I greet the spectre lady in the mirror every morning. Great work Joan!